You are also allowed and encouraged to post messages about this software tool on forums! Link to us and get a free copy! Send us an email! We do read every email and reply if requested! Award winning software tool to backup, restore and transfer your email on Microsoft Windows PCs. Outlook Express Backup Genie saves emails, settings, address books, message rules, mail and news accounts, blocked senders lists and signatures to a compact, compressed backup file from which your email can be easily restored at any time. Unlike other backup tools, Genie archives email from ALL of the top 9 Email Clients including Outlook Express, MS Outlook, Incredimail, Netscape Messenger, & Eudora PocoMail. The scheduling feature makes it easy for you to save email folders and settings daily, weekly or at any specified time period. Your email can be backed up on one computer and restored to another, thus making the software an excellent synchronization tool. The user interface is simple and easy to use---even for beginners. Easy-to-use interface, the user can choose the wizard or the normal mode! Easily select what data to save or restore. Transfer emails and settings between different computers: easy and fast. Can save several identities to a single file. Scheduler can do automatic backups periodically without requiring your supervision. Viruses, software failures, power failures, human errors, and harddrive failures... are only a few examples of what could destroy the data on --- including all emails and contacts --- on a computer's hard drive. People usually don't think about the importance of backing up data until they lose it all. 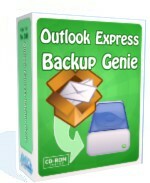 Outlook Express Backup Genie is one of the best tools available. It provides peace of mind by creating compact backup copies of your email database periodically. The backup process can be manual or it can be scheduled to run quietly in the background at specified time intervals. After a crash or a reformat, you can restore the email database in no time! You can download the Free Fully Functional 15-Day Trial Version v2.0 ( 1.3 Mb ) by clicking on the link below. Download time: 3.40 min at a 56Kb Dial-Up connection. After download, open the file OEBGenieSetup and the installation wizard will appear. Then, follow the easy on-screen steps to complete the installation. Q. Can I backup emails in IncrediMail and restore them to Outlook Express? A. No. Emails are restored to the same type of email client from which they were saved. For example, you can't restore a backup created from Eudora to Outlook Express but you CAN, of course, restore an Outlook Express backup to Outlook Express. Q. I use MS Outlook and my wife uses Outlook Express on the same computer. Can we backup both email clients with this software? A. Yes, you can backup MS Outlook and Outlook Express on the same machine, and you only need one License (this makes Outlook Express Backup Genie more cost effective than most other solutions)! Q. Can I backup emails from Outlook Express on Windows Me and restore them to Outlook Express on Windows XP? Please visit Outlook Express Backup Genie FAQ for a complete list of Frequently Asked Questions. "E-mail is a critical part of our daily business processes. In these days of destructive viruses, it's important to have an easy-to-use utility that allows us to backup and restore E-mail messages, accounts, rules, address books, signatures, and blocked senders. I use Outlook Express Backup Genie to backup my email! It is an Excellent e-mail utility and I recommend it to all who want to avoid the frustration of lost e-mail information." "Outlook Express Backup Genie is easy to install and has a friendly, intuitive face to the non-technical user. I backed up several thousand e-mails in a matter of minutes both to a CD-R and to an other computer. For the first time, I feel secure that a hard drive failure cannot impact my business!" Outlook Express is a registered trademark of Microsoft. Eudora is a registered trademark of QUALCOMM Incorporated. It's the ultimate protection for Email. It's the only utility which supports several popular Email Clients ( including Outlook Express ) in one package. Low cost solution: If you were to purchase any other tools, you'd need one for each Email Client ( eg. one for Outlook Express and one for MS Outlook ), so the total amount spent would be more than twice as much! Very easy to use, has a wizard mode that is intuitive and powerful. No. 1. Email Backup utility, fast, safe and works smoothly. Fast technical support via email for all of our customers . It's the perfect tool for both home users and companies.